SkyCiv has a powerful hand calculation modules, that show the step by step hand calculations for reactions, BMD, SFD, centroids, moment of inertia and trusses! 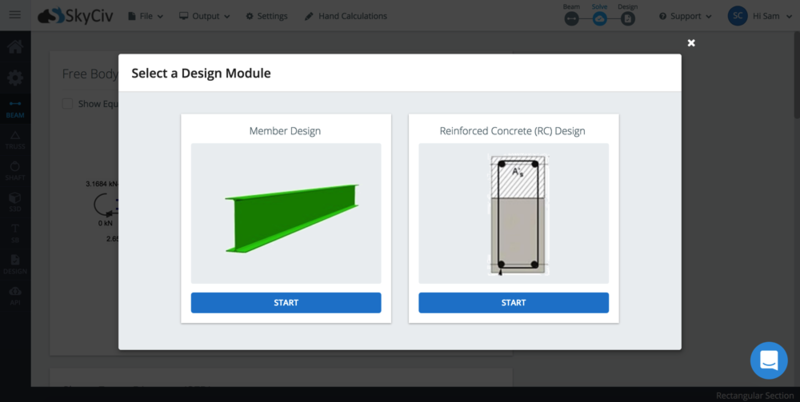 Add as many supports, loads, hinges and even additional members with SkyCiv paid plans. Tackle any project with this powerful and fast beam software. Import design modules such as AISC, ACI, Eurocode, Australian Standards, CSA, NDS and much more, to complete all your designs in one place. Welcome to our free online bending moment and shear force diagram calculator which can generate the Reactions, Shear Force Diagrams (SFD) and Bending Moment Diagrams (BMD) of a cantilever beam or simply supported beam. Use this beam span calculator to determine the reactions at the supports, draw the shear and moment diagram for the beam and calculate the deflection of a steel or wood beam. Free online beam calculator for generating the reactions, calculating the deflection of a steel or wood beam, drawing the shear and moment diagrams for the beam. This is the free version of our full SkyCiv Beam Software. This can be accessed under any of our Paid Accounts, which also includes a full structural analysis software. Use the interactive box above to view and delete the beam length, supports and added loads. Any changes made will automatically re-draw the free body diagram any simply supported or cantilever beam. 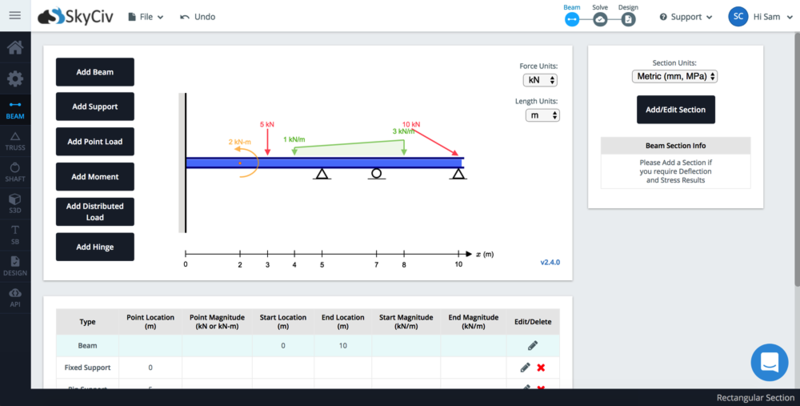 The beam reaction calculator and Bending Moment Calculations will be run once the "Solve" button is hit and will automatically generate the Shear and Bending Moment Diagrams. You can also click the individual elements of this LVL beam calculator to edit the model. The beam span calculator will easily calculate the reactions at supports. It is able to calculate the reactions at supports for cantilever or simple beams. This includes calculating the reactions for a cantilever beam, which has a bending moment reaction as well as x,y reaction forces. The above steel beam span calculator is a versatile structural engineering tool used to calculate the bending moment in an aluminium, wood or steel beam. It can also be used as a beam load capacity calculator by using it as a bending stress or shear stress calculator. It is able to accommodate up to 2 different concentrated point loads, 2 distributed loads and 2 moments. The distributed loads can be arranged so that they are uniformly distributed loads (UDL), triangular distributed loads or trapezoidal distributed loads. All loads and moments can be of both upwards or downward direction in magnitude, which should be able to account for most common beam analysis situations. Bending Moment and Shear Force calculations may take up to 10 seconds to appear and please note you will be directed to a new page with the reactions, shear force diagram and bending moment diagram of the beam. One of the most powerful functions is using it as a beam deflection calculator (or beam displacement calculator). This can be used to observe the calculated deflection of a simply supported beam or of a cantilever beam. Being able to add section shapes and materials, this makes it useful as a wood beam calculator or as a steel beam calculator for lvl beam or i beam design. For now, this functionality is available in SkyCiv Beam.